By now you probably know that when I find something fun and free to do, I have to share it. This time it&apos;s the First Friday Cruise-In, which takes place the first Friday of each month when hundreds of cars fill the Hendricks County Courthouse Square in downtown Danville, Indiana. This awesome car show starts at 5 p.m. and normally runs to 9 p.m. Although the Cruise-Ins started in May (they run through October!) I didn&apos;t get my first opportunity to attend until the most recent one on July 6. 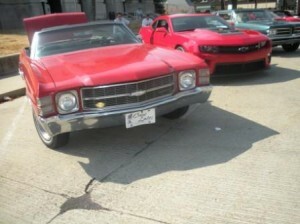 The cruise-in offers anything and everything you could want -- including hot rods, classic cars and muscle cars. One thing I found very surprising was the abundance of classic tractors -- something unexpected that I definitely thought was a a great addition! One of the drivers explained to me that taking out these type of cars in extreme heat can be dangerous, because the plastic used in earlier decades is different than the plastic used today and warps much easier. With temperatures easily around 100 degrees that day, I was glad to see how many cars came out despite the heat. The best part of the cruise-in was the mood of the entire downtown square. 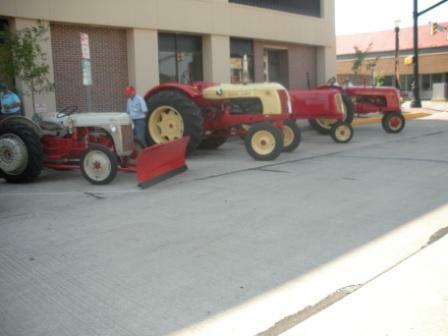 It was fun to see how everyone interacted and it seemed like all of the car and tractor owners knew each other and were laughing and joking the entire time. Food was available for purchase, music was playing and cars lined the entire Courthouse Square -- it was like a free block party! Owners and drivers always have a good time but during this cruise-in, they were given something extra sweet: official race plaques. The Hendricks County and Convention Visitor&apos;s Bureau handed out these plaques for the first time, making the event even more official for the regular cruise-in attendees. For those of you whom aren&apos;t familiar with race plaques (I had no clue what it was up until this point) it is a business-card sized plaque that states the date and location of the cruise-in -- serving like a scrapbook of sorts so owners can remember where they went and showed their cars. Don&apos;t forget to come check out the next First Friday Cruise-In Aug. 3 -- there&apos;s only a few left! Have a favorite car you like to see during the Cruise-Ins? Share by leaving a comment below.